In the 360th Episode of the Iron City Rocks Podcast we welcome Trans-Siberian Orchestra and Whitesnake’s guitarist Joel Hoekstra. 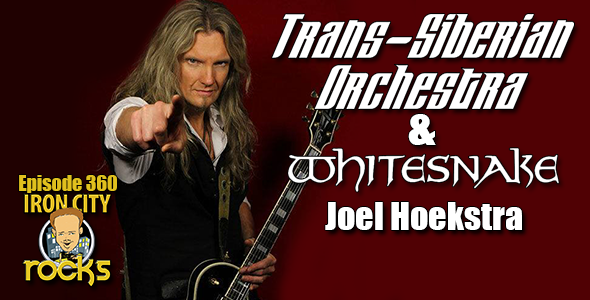 Joel took some time while on the road on the 2017 TSO tour to talk with us about what life on the road post-Paul O’Neil is like, the production of this years show and the tradition the TSO has become. We also talk about his stint playing in Cher’s band and how that experience has been as well as his hectic 2018 with Whitensake’s tour with Foreigner and new album, Flesh An’ Blood. We also introduce a powerhouse, prog-metal band from Houston, Wildestarr. David Starr (formerly of Vicious Rumors) and Lodon Wilde give us all the details behind that fantastic new album Beyond The Rain. We are then joined by a fantastic guitarist, Lou DiBello, and talk to him about his album Heat Wave.